An immersive way to enter the realm of Talis. If you already have the photo-illustrated physical or eBook, you might enjoy following along with the images as you hear the chapters -- but this audiobook production of the full narrative can be enjoyed on its own! 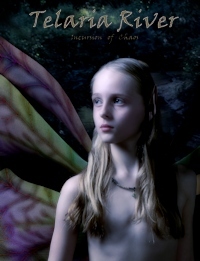 The storytelling by Elie and others near the Telaria is beautifully voiced by Charlotte Elizabeth Poe, and specially accented with music by renown Norwegian violinist Martine Kraft. So download your copy today and listen in the car, on your smartphone, on your computer...wherever! I really appreciate reviews and feedback too! Play Sample 1 (from Chapter 1): Your browser does not support the audio element. Play Sample 2 (from Chapter 4): Your browser does not support the audio element. 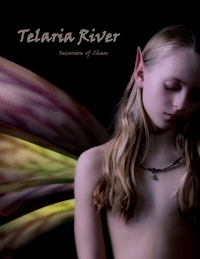 Telaria River is beautifully custom-printed in the U.S. on semi-gloss photo paper as a large color photo art book. Since they are made to order, retail copies are pricey (about $120 hardcover and not much better on Amazon.com or BarnesandNoble.com). While we effort for a less expensive bulk printing are explored, you may be able to order a copy directly from the author while his limited stock remains -- contact Jeff using the info on this website to inquire! Electronic formats can't really replicate the beautiful layout design, image integration, and page-flipping experience of the printed book. However, the e-book version is certainly more affordable and portable, and the narrative text is exactly the same. All the same color images are included, but the size and quality of image display will vary greatly depending on device and format selected. WHICH eBOOK FORMAT IS BEST? All 3 formats are same/similar price, so you should choose based on type of device and app you plan to use. Keep in mind portable e-reader devices designed primarily for traditional novels will display the text fine, but may be limited in image rendering. Availability and author's suggestions are below. PDF: RECOMMENDED for best image reproduction and attractive layout. Intended for reading on computers or tablets that can display PDF files in color. The downloadable PDF file (about 70mb) efficiently preserves image size and quality better than the other formats, and requires no special display adjustments. Best viewed/read using free Adobe Reader app, which allows clear zooming/enlarging of text and images. Other PDF-compatible e-readers such as Nook can work also -- be sure your reader can handle PDF first. It is suggested you read by scrolling/paging down in the 'full screen width' mode, then zooming in our out as desired. Works well for reading the narrative, and displaying small versions of all the images, on many eReader devices and applications (e.g. Sony eReader, Kobo eReader, NOOK, iBooks (iPad/iPhone/iPod), Stanza, Bluefire (iOS & Android). File size is -large considering the non-zoomable, rather small images. If you use this format, you should go to the "text" settings and either set "Publisher Defaults" to "on" or change the theme to "night". Works well for reading the narrative, and displaying small versions of all the images on Amazon's Kindle devices or Kindle apps. Recommended only if you are unable to use the PDF version. Rather small images. If you use this format, you may want to go to the "view" settings and set "Black" color mode. Google Play: Search 'Telaria River'. Excellent online preview, good format for preserving image quality for Android phones, tablets, ChromeBook.